We were led to expect that Google would be making a big push this year at CES with Google TV and had a number of hardware partners ready to announce devices, and Netgear has just jumped on that train. 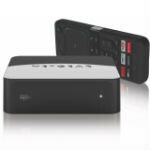 This may not be the best Google TV box we see unveiled, but at $129, it could easily be a winner anyway, and we're hoping the pricetag is something of a trend for Google TV devices this year. What's especially surprising about Netgear's announcement is that the $129 Google TV box, dubbed the NeoTV Prime, is actually the top-tier device. There will also be a lower tier NeoTV Max (whoever named these devices needs to be fired), which will strip out the Google part of Google TV, and be more like a normal streaming box with Slingbox-type capabilities and access to some services like Netflix. The NeoTV Prime is a relatively nondescript black box with rounded edges. It is quite small at 4.7" wide x 4.1" depth x 1.5" tall. As you would expect from the name, it offers Google TV's new PrimeTime guide, which makes it easy for you to get to the shows and channels you love, and also offers everything you'd expect from Google TV including the apps, search, etc. It was a bit odd that the NeoTV Prime can actually run on two AAA batteries instead of being plugged in, but no word on battery life, or when anyone would ever need this option. Another odd thing is that Netgear only had product renders to show, because the device is supposedly available immediately. No word on pricing or availability of the NeoTV Max.